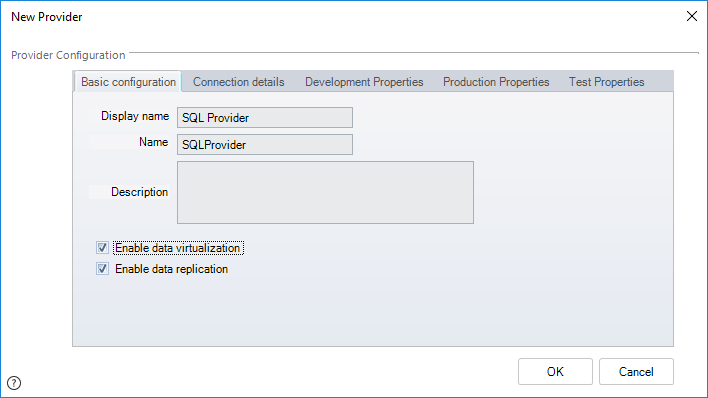 Bizagi presents a Replication Wizard which will assist the configuration to connect to an external SQL Server or Oracle database (and automatically create any necessary components). However, for more sophisticated scenarios, you may want to use the Advanced Configuration, which is an alternative way to set Replication in your project. •The use of a data source which is not SQL Server or Oracle (using Custom Replication). •The requirement for advanced configuration (e.g. wanting to use an Oracle column which has an unsupported data-type). •The need to manually adjust the configuration. This may happen in sophisticated scenarios where you have a whole set of tables which are related to each other. 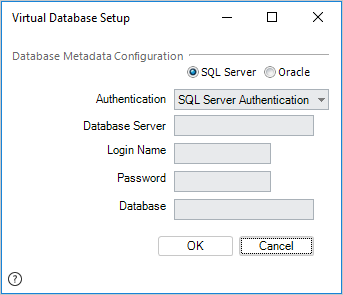 This may involve relationships with virtual entities, and therefore this configuration requires that all of these tables are replicated and virtualized with some considerations. The following article illustrates how to set Replication in Bizagi by using the Advanced configuration options. If you wish to view further detail and an example about replicating a MySQL, refer to Customizing Replication. 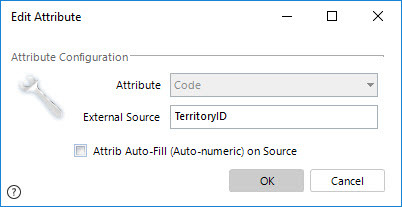 In order to set Replication through the Advanced configuration, make sure that you have already created the necessary Parameter Entities and their attributes (to store the incoming values from the external data source). For further information about creating entities in Bizagi, refer to the Creating your data model article. Notice that the entities created in Bizagi should have a similar data structure to those in the external data source (for example, the corresponding data types to store the columns' values of the external tables). 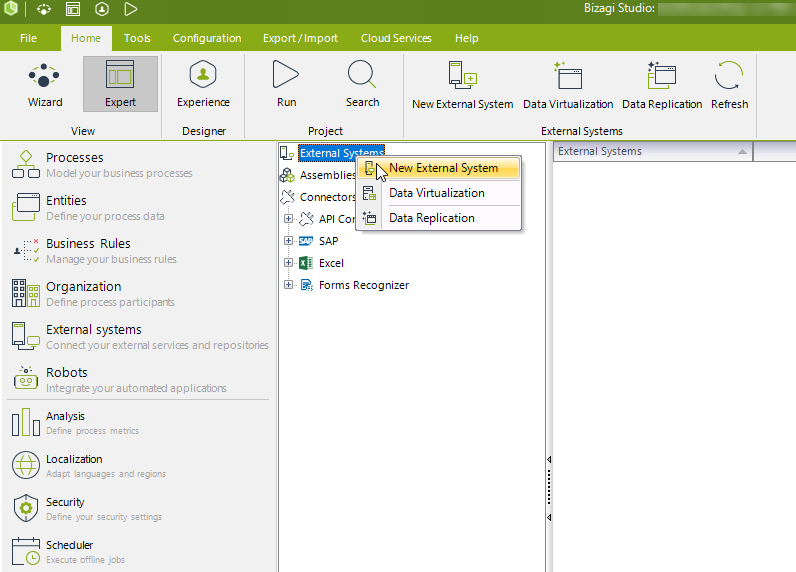 To use the Advanced configuration for Replication, go to the External systems module view in Bizagi Studio. 1. Creating the entities in Bizagi with their attributes to match data at the source. This is done through Data modeling. 2. Defining an External System. Define the information for the system where the external data source is found. 3. Defining a Data Provider. 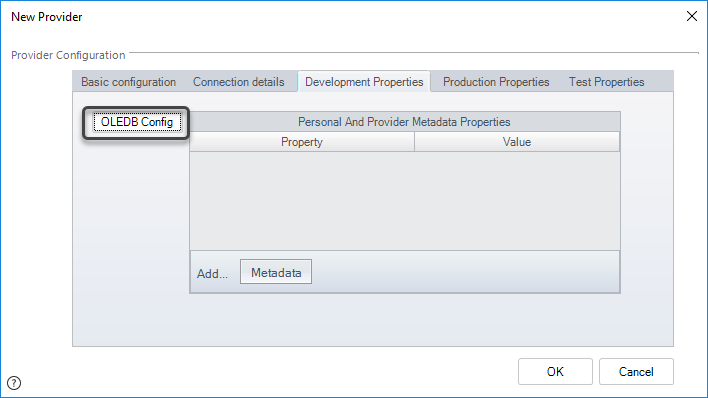 Specify details for the Data Provider (the connection information to the external data source). We need to explicitly define if we will be using a custom implementation. 5. Defining a Replication Schedule. Specify a scheduled job which will execute the Replication's synchronization. 6. Including Parameter Entities for the Replication. Include one by one, each of the Parameter Entities to be replicated for this connection (Data Provider) and given Replication Schema. 7. Matching attributes in Bizagi to the sources' columns. Map each of the attributes in the replicated entity to correspond to a column at the source. 8. Using additional configuration options. Finally, there is the possibility to use additional options for each replicated entity set, such as: Defining filters for records incoming from the external table, indicating if an attribute (column) of those entities will be disregarded, etc. Once we have done these configuration steps, we may also run an initial import for these tables or views, so that we can test that the integration was properly set (checkpoint). In this example, we will replicate the following tables from a Southwind database (in Oracle): Territories, Region and Shippers. Our first step is to make sure that these tables have been previously created in Bizagi as Parameter Entities. We create Region, Branch and Shippers as Parameter Entities in Bizagi. 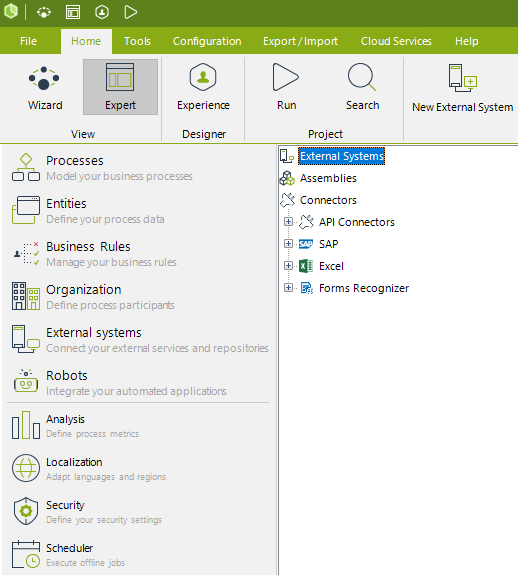 To define a new External System to be used in this integration, right-click on External Systems and select New External System. 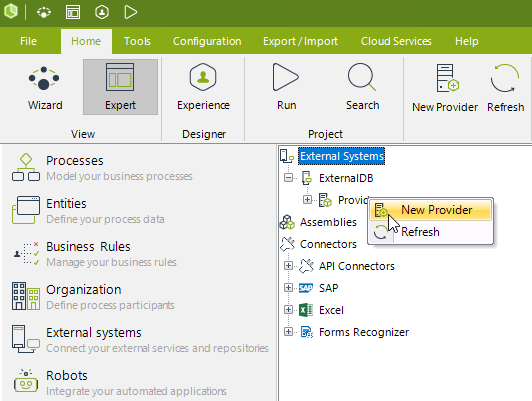 In the New External system window, define the information for the system where the external data source is. Enter the detail for this new system: Display Name and Description. Make sure you also check the Enable data providers option. Once you have defined and created the new external system in Bizagi, we will enter the details for the Data Provider used by this System and its Replication configuration. To do so, right-click on the Providers node located under the newly created system, and select the New Provider option. In the Basic configuration tab of the New Provider window, enter the detail for this new provider: Display Name, Name, and Description. 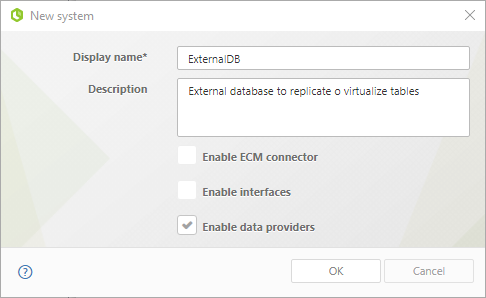 Make sure you mark the Enable data replication option. Then, in the Development Properties tab, click on the OLEDB Config button. Notice you may set different values for your different project environments (Development, Test and Production). In this example, we will set the Development Environment properties. If your external data source is in a SQL Server database, select the SQL Server radio button and specify the following details. •Login Name: A login account to access that Database. Take into account that this account requires read-access to the tables or views to replicate. •Password: The password for the previous Login Name. •Database: The name of the Database where the tables or views to replicate are held. •User Name: The name of the user schema. •Password: The password for this given User Name. 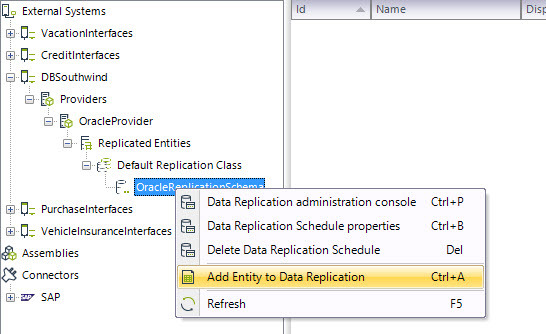 In this example, we illustrate Replication configuration with an external data source in Oracle. 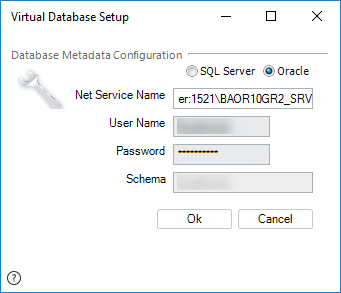 In the Virtual Database Setup window, we enter the Net Service Name, User Name and Password information. Click OK to save this connection. Click OK again when returned to the New Provider window. Take into account that you may define the properties and connection values for this integration for the different environments separately (Development, Test, Production). However, the definition for the Test and Production environments can only be done before this system and provider is deployed into that target environment. Edition of the values in Test or Production has to be done after the first deployment by using the Management Console. 4. Registering the Replication class. Next, we need to create a Replication class in Bizagi which can be defined to use Bizagi's default components (Implementation Class), or to use a custom component (e.g. to connect to MySQL, Postgresql, DB2, etc). Here we need to define if we will be using a custom implementation. In this example, we will use Bizagi's default components. To do so, we define a Replication Entity Class by right-clicking on the Replicated Entities node and selecting the New Data Replication Class... option. 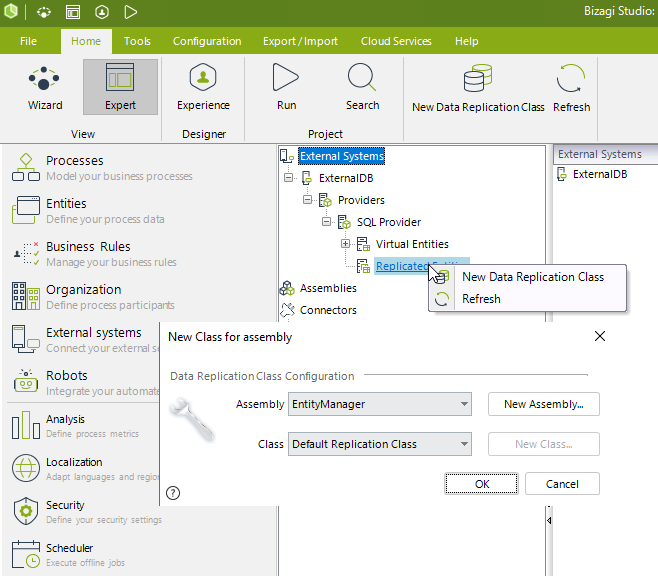 Leave the defaults and click OK.
Once the Replication class is created or registered, we specify its Replication Schema to run periodically as a scheduled job. 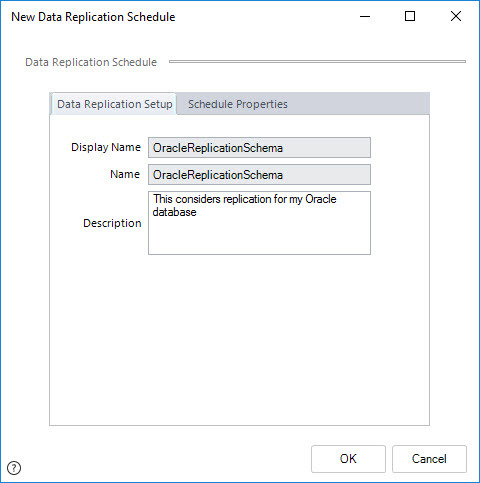 To define this schema, locate the Replication Class (the default one is called Default Replication Class) under the Replicated Entities and right-click on it to select the Add Data Replication Schedule option. In the New Data Replication Schedule window, type a Display Name, Name and Description for this Replication Schema. On the Schedule Properties tab, specify the frequency for which the information will be replicated from the data source (synchronized from the data source into Bizagi). In this example, the replication will occur every week on Tuesday and Friday at 8:00 pm starting on August 22, 2015. It is required that the scheduler service of the environment is on and running. For more information about the Scheduler service and its management from the Management Console. 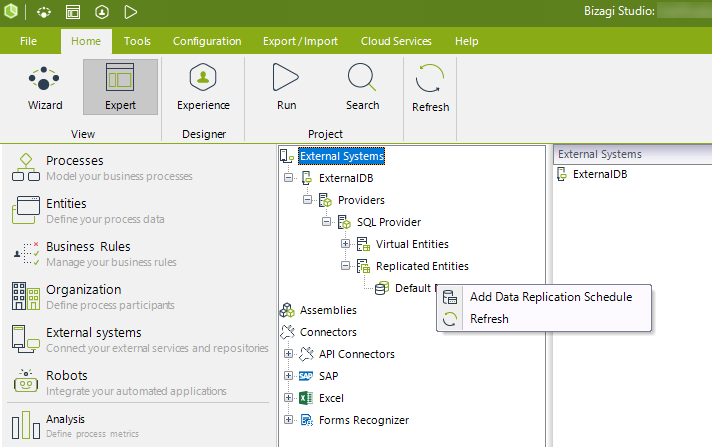 If you wish to immediately run a synchronization for replicated entities, refer to the Replicate Now option described at the Additional configuration options. Mark this option for Bizagi to execute the data replication from the external source. Define if the execution happens once a day (and at which time), or if it should be executed every certain time (minutes or hours). Now that we have set a Replication Schema, we will include in it our Bizagi Parameter Entities and match them to the external data source's tables. To do this, include one by one each of the Parameter Entities used in this Data Provider's Replication. For instance, we will add our Territories entity and match it to the Branch table from the source. 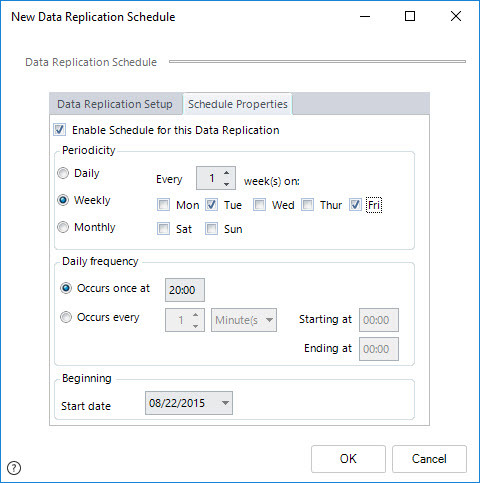 Right-click on the newly created Replication Schedule node, and select the Add Entity to Data Replication option. 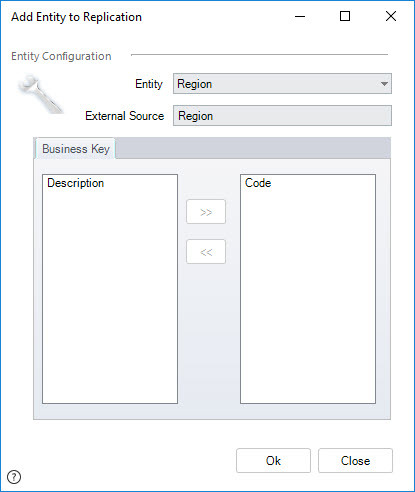 In this step, along with the source table definition, you may also define which of the source columns will be taken as business keys for the values in the entity. The business keys should correspond to the primary key of the source's table. Do this for each of the Parameter Entities (Region, Branch, and Shipper in our example). Notice that this means that once our defined Replication Schema executes, it will synchronize the information for the Region, Branch and Shipper entities. Once we have added entities to the Replication Schema, they will be listed under the Provider. 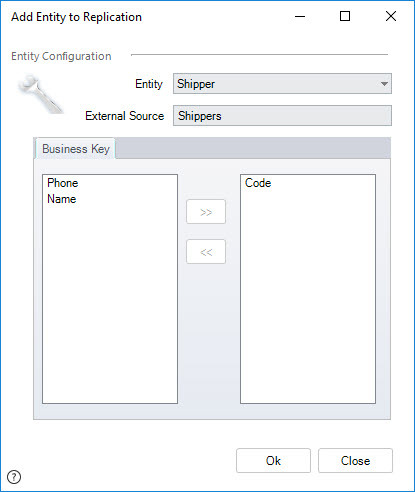 By clicking on a specific entity (in our example, we need to do this for each of the 3 Parameter Entities), in the right panel you will be presented with the entities' current attributes. For the Branch Code, we type its matching external source's (TerritoryID column). Repeat this step for all the attributes in each of the replicated entities. Notice that all listed attributes need to have matching information in their External Source property. Should there be any attribute which you don't want to consider in the Replication, refer to the next section. At this point, we completed the Replication configuration setup done through the Advanced options. You may use additional configuration options as described in the section below, and verify that the values for these Parameter Entities are properly synchronized. Finally, there is the possibility to use additional options for each configured replicated entity, such as: Defining filters for the records in those tables to be replicated, defining if an attribute (column) of those entities will be disregarded, etc. View more information about these options at the Additional configuration options article. Once Replication is configured, you may choose to verify that its execution synchronizes the Parameter Entities with the external tables. There are two ways to do this: using the options in the Systems modules, or through the displayed entities information (Entities module). Options presented in the Systems modules are useful for a Production or Test Environment. Options presented in the Entities module will serve as a checkpoint while configuring Replication (in the Development Environment). To view how to verify that the Replication was set up correctly or is running properly, refer to Verifying Replication.